The Faculty of Law, University of Dhaka takes pride of being center of excellence, where it encourages students to take part in moots in order to have a taste of practice in court procedure. Moot court is an activity peculiar to law schools in which participants take part in simulated court proceedings, starting with the drafting of briefs and participating in oral arguments before a bench of Judges. It helps them in developing certain skills that every law student should possesses, namely, art of persuasion, way of putting a case precisely and intelligibly, fluency and clear enunciation of principles of Law. Keeping that in mind, since 2005, the Faculty of Law, University of Dhaka has been successfully organizing National Henry Dunant Memorial Moot Court Competition every year in collaboration with the International Committee of the Red Cross (ICRC), specially to promote interest, study and research on International Humanitarian Law among the law students. 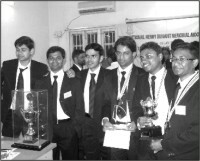 In this consecutive process, the Faculty of Law, Dhaka University organized the 3rd National Henry Dunant Memorial Moot Court Competition on February 9, 2008. The competition is named in memory of Mr Henry Dunant, the co-founder of the ICRC. The daylong competition was formally inaugurated by Professor Dr. Borhan Uddin Khan, Dean, Faculty of Law, University of Dhaka. Mr. Finn Ruda, Head of Bangladesh Mission, ICRC addressed the participants as the special guest in the opening ceremony. Professor Dr. Taslima Monsoor, Chair, Department of Law, University of Dhaka, Mr. Benarji Chakka, Legal Officer, from ICRC, New Delhi and Mr. Nazmuzzaman Bhuian, Moderator, Dhaka University Moot Court Society (DUMCS) were present on the occasion. On the basis of the criteria set by the ICRC for the eligibility of the participants in the Moot Court competition, students from four Public Universities namely, University of Dhaka, University of Chittagong, University of Rajshahi and Kushtia Islamic University participated in the competition. Each participating University nominated a team consisting of three student members, and a coach from the faculty of the University that they represent. Chittagong University and Dhaka University made their way to the final round and Dhaka University became the Champion. The eminent judges who were selected from the different categories such as academicians, Judges of the Supreme Court, Senior Advocates and the Judge Advocate Generals judged the teams. This time, this prestigious event was expanded by inviting representatives of the Law Faculties of four Private Universities namely, South-East University, Northern University, Stamford University and Eastern University as observers, who are going to participate in the 4th National Competition. The team of University of Dhaka consisted of Manjur Al Matin, Tapas Bandhu Das and ASM Sayem Ali Pathan. Kakon Dey, SM Kaiser Mosharraf Yusuf and Tafsir Matin constituted the team of University of Chittagong. Manzur Al Matin of Dhaka University received the best mooter's award and Tafsir Matin of Chittagong University received the best researcher's award. University of Chittagong was also awarded the Best Memorial Trophy. The prize giving ceremony was graced by the presence of the eminent Judges of the Supreme Court, Mr. Justice Zubayer Rahman Chowdhury, Mr. Justice Md. Ashfaqul Islam and Mr. Justice Md. Miftahuddin Choudhury, who distributed the prizes among the participants. Professor Dr.Borhan Uddin Khan in his closing speech warmly thanked the ICRC, Bangladesh Mission and ICRC, New Delhi for their cordial support in organizing such prolific event for the law students.